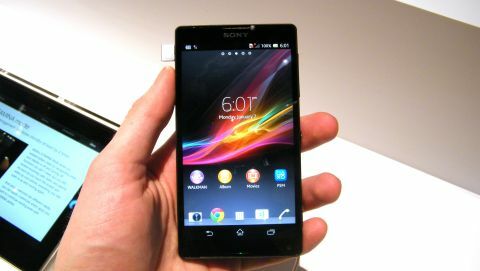 Sony launched its latest flagship device at CES 2013 in the form of the Xperia Z, but this phone has a twin – the Sony Xperia ZL. Pigeon-holed for the American market the Xperia ZL won't be making it to places such as Europe and Asia, but it still features much of the same tech that is found in the Xperia Z. Due to launch in the first quarter of the year the Sony Xperia ZL packs in some pretty impressive specs including a full HD, 5-inch display and quad-core processor. The key difference between the Xperia ZL and its twin is the exterior, as it sports a different chassis which has a smaller footprint at the expense of thickness. Measuring 131.6 x 69.3 mm the Xperia ZL fits snugly in the hand and while it may be 9.8mm thick it certainly doesn't feel cumbersome, with the 151g body a pleasant weight. The curved, textured plastic rear case means the ZL is a lot more grippy than the glass clad Xperia Z and a flap at the bottom covers the microSD and microSIM ports. This port cover is the only blemish on what otherwise is a good looking device, as it doesn't quite snap down completely flush with the handset, which makes it look like a cheap afterthought. We had the same complaint with a similar setup on the Sony Xperia T and it seems an odd design choice from Sony. Also round the back is a 13MP EXMOR RS camera capable of capturing HDR photos and videos, the latter filmed at 1080p. The Xperia ZL also features a dedicated camera shutter button towards the end of the right hand side, below the central power/lock key and volume rocker towards the top of the handset. This camera button was not included on the Xperia Z, but Sony has obviously decided that the American market loves a classic shutter key, which doubles as a quick launch to the camera app as well as a tool for actually taking photos. As we've mentioned the Sony Xperia ZL sports a 1.5GHz quad-core processor and 2GB of RAM which means Android 4.1.2 Jelly Bean absolutely zips along, and it's noticeably snappier than the similarly feature-packed Huawei Ascend D2. Sony has assured us that the Xperia ZL will receive the upgrade to Android 4.2 in due course, but there's no exact date for the roll out just yet. Android looks beautiful on the Xperia ZL's 5-inch Reality Display which also benefits from Sony's Mobile Bravia Engine 2 technology, boosting the colour reproduction and quality of the screen to provide an excellent viewing experience. Sony has stuck its own overlay on Android and it's one we're fond of as it doesn't close down the platform and looks pretty smart. Due to the reduced bezel around the screen on the Xperia ZL the front facing camera, traditionally located above the screen, is actually found in the bottom right hand corner. The peculiar placement of the 2MP snapper, also featuring Sony's Exmor RS sensor proves a challenging location if you're holding the phone in portrait, with a hand or a finger tending to cover it. We spoke to Sony about its placement and were told that moving the camera to the bottom saved 1.5mm in the length of the handset – allowing it to keep its small footprint. There's also a neat notification light centrally located at the base of the Xperia ZL, which can glow a variety of colours depending on the type of alert it's flagging up. It's a handy little feature and far less offensive to the eye than the blinding LED light on the Samsung Galaxy Note 2 and co. Watching videos, viewing photos and playing games on the Xperia ZL is an immensely enjoyable experience with the screen really popping and drawing you in to what's happening. The responsive screen means that gaming is well catered for with instant recognition of your various pokes and prods, while giving you enough space for on-screen controls which don't get in the way of the action. Connectivity options such as 4G LTE, Wi-Fi, Bluetooth, A-GPS and MHL are all present, as is NFC technology, which Sony is really hammering home this year with a variety of NFC-enabled devices and accessories which makes it easy to share content between your tech. The open-air headphone jack on top and microUSB port on the left side of the Xperia ZL tells you that this handset doesn't have the dust- and water-resistant properties of the Xperia Z, so you'll need to take extra care when using it in the bath. The Sony Xperia Z is set up to be a blockbuster of a device with a fantastic array of features making it a highly desirable smartphone. Sony finally has a handset which is capable of challenging the likes of the iPhone 5 and Samsung Galaxy S3 and we can't wait to put it through its paces in our in-depth Sony Xperia ZL review.